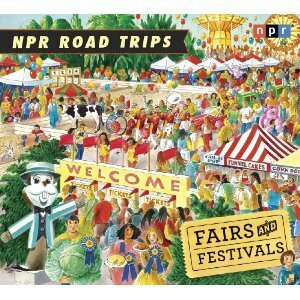 Title : NPR Road Trips: Fairs and Festivals: Stories That Take You Away . . .
A lighthearted listen for a road trip. Nothing exceptional, but it kept me awake and entertained! Expectations. I expected that an NPR collection would really contain compelling audio, great radio bits that got behind the scenes and left you knowing more and enjoying the experience. Not so much this set. The shortness of the bits, mostly a couple of minutes, didn't allow the drama to come out like some of the better (often longer) stories in other collections. There was one story about a sideshow act that pounded metal spikes into his nose that was obviously visually interesting but didn't make the leap to being a good audio story -- why include something that really doesn't work? There were a few times where the background audio was interesting, but the stories didn't hold up. In all the topics were good, but the execution was not. At least it was only an hour. I'd suggest trying another NPR collection before this one. Fun radio segment. Learned about a lot of festivals and fairs I didn't know existed. Really made me rethink my career goals too lol maybe I should be selling cotton candy. Maybe my standards are too high.Maybe my expectations are too high.Maybe it's because I am from the Midwest.Maybe this book suffers from coming after two exceptional texts.Whatever the circumstances, NPR, I am disappointed.This was the third in a slew of NPR audio collections, the first two of which were Fan. Tastic! However, this book sucked. It wasn't informative. It wasn't funny. It wasn't enriching. Sad face. Well, they were all NPR broadcasts, and they all featured fairs and festivals, so there's that going for it. I guess I was expecting the best of the best, those "driveway moments" that keep you sitting in your car because you're just so engrossed in the story. Not so with this; they were more "I just drove 5 miles and didn't notice until my exit that I've tuned out" moments. This was a neat book to listen to on the way to work. Lots of interesting stories.